Robbie Seastrunk is a full-time Paramedic and Field Training Officer at LifeNet Inc. in Texarkana, Texas. After graduating from high school, Robbie joined the local volunteer Fire Department. While with the Fire Department, Robbie attended the Arkansas Fire Academy EMT course. 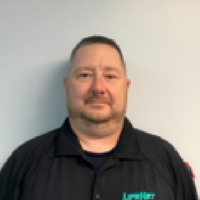 Upon completion, Robbie became an Industrial EMT for Weyerhaeuser in Mt Pine, Arkansas where he worked for eight years before choosing to become a full-time EMT in Hot Springs. Robbie continued his education and obtained his Paramedic certification in 2000. Since that time, Robbie has worked as a Paramedic, Operations Manager, and Field Training Officer in Hot Springs and Hot Springs Village, Arkansas, and Texarkana, Texas. Robbie possesses the ability to positively interact with anyone. Robbie consistently demonstrates a commitment to providing both great service to patients and support to his fellow team members. Robbie prides himself in making a difference in every patient’s life, regardless of the situation presented, putting them instantly at ease with his calm, easy-going demeanor. Robbie also enjoys mentoring new team members and Paramedic students, doing so in such a way that makes them feel welcome and completely at ease in the stressful environment of EMS. In his free time, Robbie enjoys spending time with Christy, their children, & grandson. Robbie loves hunting, fishing, and all outdoor recreational activities.